It was over five decades ago, on January 4th, 1967, that British speed ace, Donald Campbell, lost his life to the cold dark waters of Lake Coniston in the English Lake District. In a macabre sense, it was a fitting end to Britain’s most enigmatic record breaker and one that lifted him from a flawed hero into legend. 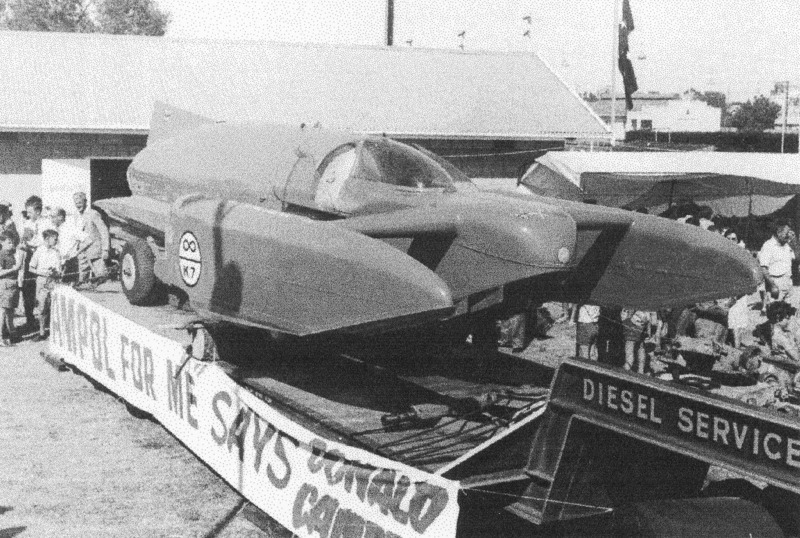 For Donald Campbell had appeared to be many things. He was fiercely patriotic, extremely superstitious, generous and charming one minute, arrogant and uncompromising the next. But to those who got close enough, Donald Campbell was full of a gnawing self-doubt that did not sit well with the popular belief of what a hero should be. To understand this man that had broken the World Water Speed Record on seven occasions, and the Land Speed Record once, one has to search his past. Born in 1921 the son of Sir Malcolm Campbell, Britain’s most successful record breaker, it was hardly surprising that he would one day try and emulate the man he hero-worshipped, even idolised. But Sir Malcolm was a tough, overbearing, and some would say, cruel father, who had unrealistically high expectations for a son who did not shine academically at school, and who much preferred to be playing sport or working with his hands. Bluebird CN7 sits poised on her built-in jacks. Indeed, the young boy afflicted with a nervous stutter barely survived a childhood fraught with accidents and illness. At the age of eight Donald was taken by his father on an unsuccessful record attempt to South Africa, and upon returning to England contracted typhoid fever, which very nearly claimed his life. Eight years later he came down with rheumatic fever, a debilitating disease that permanently damages the hearts’ valves, forcing the teenager to be wheelchair bound for many months. Then the following year, he fell from his motorcycle and fractured his skull in two places. When war broke out in 1939, Donald spent no time in enlisting for the RAF but was rejected when it was discovered he had suffered rheumatic fever. This was an extremely low point in Campbell’s life. His father, having served in the Royal Flying Corps during the First World War, was acting as a liaison officer in the Middle – East, while Donald filled in time as a special constable and a progress chaser between component manufacturers and aircraft constructors. Donald was quoted as saying, “It appeared I was somewhat of a failure. The Old Man was doing a real job of work, and here was I, playing at Policeman and having bloody silly accidents.” The accident in question was between his motorcycle and an army truck, which resulted in a broken shoulder, two cracked ribs and a broken arm. 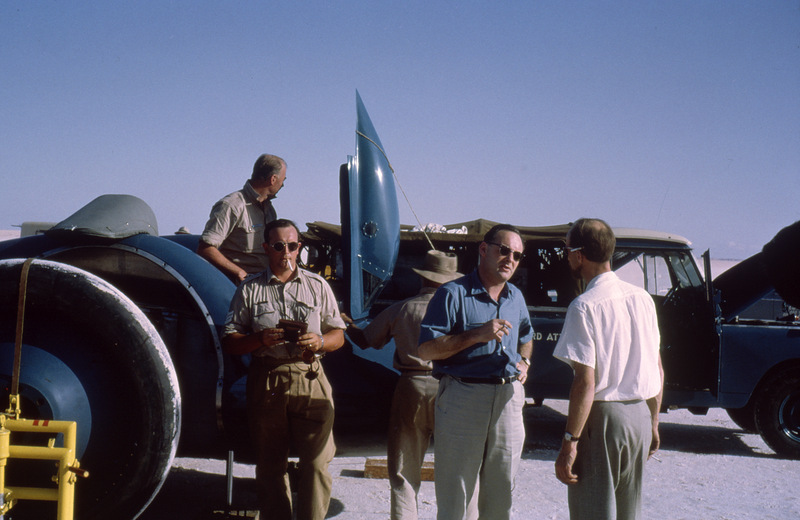 Donald Campbell in discussion with Andrew Mustard at Lake Eyre. Campbell immediately enlisted the help of Leo Villa, who had come to work as Sir Malcolm’s chief mechanic when Donald was only months old and was now almost part of the family. There was no question that Villa would help. He had always kept an eye out for the mischievous young Donald, whom among other things he had taught to drive and to dismantle a motorcycle engine. Campbell would also continue another family tradition by naming his record-breaking car and boat, Bluebird, just as his father had, in honour of Maeterlinck’s play The Blue Bird. Although Sir Malcolm had been a wealthy man, making his fortune as an insurance broker with Lloyd’s, he had left little money to Donald and his sister Jean. Most of it was held in trust for Sir Malcolm’s grandchildren, granting only a modest ten-pound a week allowance to his own children. Record-breaking had been an expensive hobby to Sir Malcolm, but for Donald finding enough money would always be a problem. 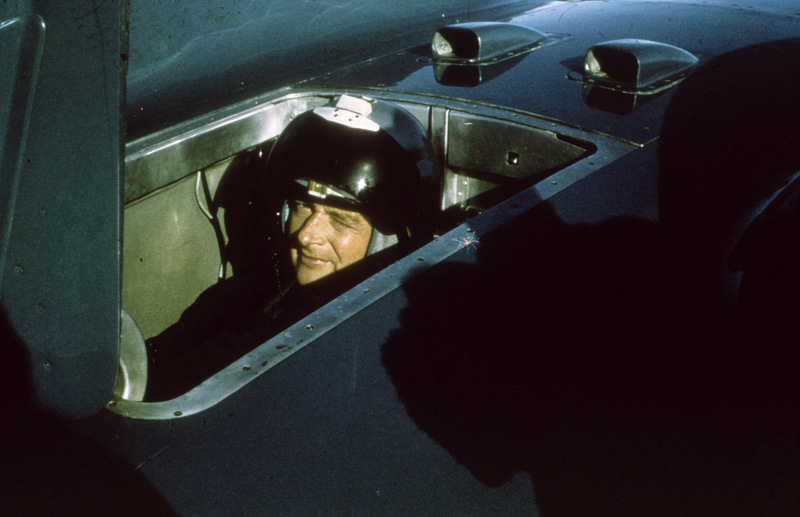 In fact, after six frustrating years of trying to break the record with his father’s old boat, Campbell was forced to sell his share in the successful engineering firm, Kine’s, and mortgage his home to finance a new design Bluebird hydroplane that would finally give him a new World Water Speed Record of 202.32mph in 1955. In doing so, he had succeeded in breaking the hypothetical “water barrier”, claimed by its proponents to lurk at 200mph and cause such severe buffeting to the hull of a boat that it would eventually disintegrate. Campbell had proven this to be wrong, and for the next five years, he continued to push the record higher, leaving it at 260.33mph. 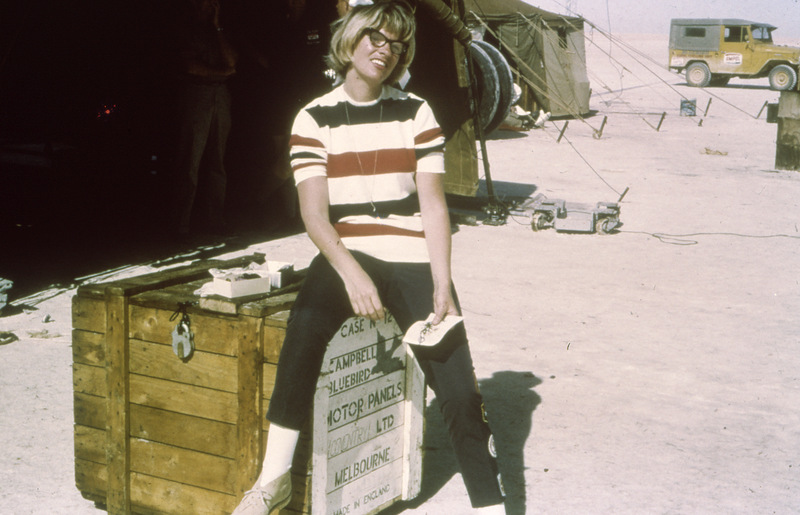 Campbell’s third wife Tonia Bern in an off-guard moment at Lake Eyre. However, the cost of his success on a personal level had been extremely high. His first two marriages had failed, due in no small part to Campbell’s single-minded preoccupation with record-breaking. He would marry his third wife on Christmas eve 1958, and outwardly, Tonia Bern, a well-known Belgian cabaret artist, seemed like an odd match. But they were both determined, strong-willed characters, and Tonia understood that in an age of increasing commercial sponsorship, they were both, to a degree, in “show-business”. But it was after his second World Water Speed Record on Lake Mead in the United States that the idea for Campbell’s most significant challenge gelled. In 1947, Englishman John Cobb had set an outright Land Speed Record of 394.20mph which for years had stood unchallenged. It now became Campbell’s obsession to recapture the record his father had held nine times. He even toyed with the idea of breaking both the water and land record on the same day! At this time Campbell’s stock had never been higher, and he was able to persuade, charm and cajole, eighty British companies to support his quest for the land record. 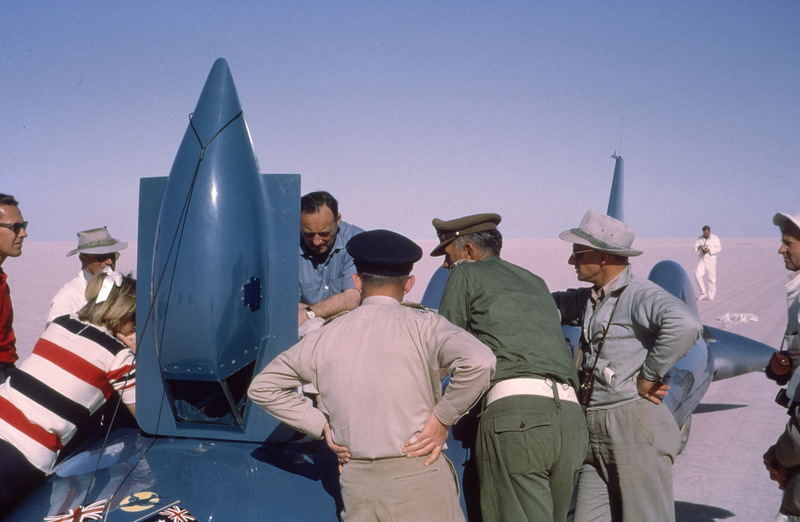 After a fanfare of publicity, in September 1960, Campbell took the enormously expensive gas-turbine Bluebird car to Bonneville Salt Flats and very nearly killed himself. Campbell prepares to make another run at Lake Eyre. Anxious to get the record, he accelerated the massively powerful car too hard, too soon. It became airborne at 360mph before slamming back down onto the salt track, bouncing back into the air then rolling over several times as it shed wheels and bodywork, before finally sliding on its belly to a halt. Somehow though, Campbell had survived the world’s fastest automobile accident. But the car was gone, a total write-off except for the gas turbine engine. When it became known from Campbell’s hospital bedside that his first concern was the Bluebird car, and how soon he could have another crack at the record, his sponsors’ rallied. Sir Alfred Owen, a hard-nosed north England industrialist whose company, Motor Panels, had been responsible for constructing Bluebird, immediately sent off a telegram offering to build Campbell a new car. 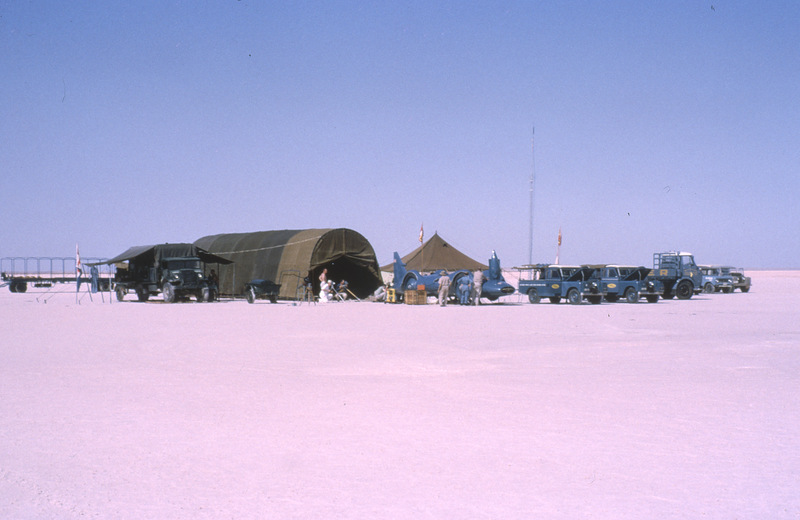 Bonneville Salt Flats, however, was no longer considered a suitable venue, the American track being considered too short to exploit Bluebird’s full potential. Campbell’s longtime sponsor, British Petroleum, suggested an alternative. It was a little-known salt lake in the far north of South Australia called Lake Eyre. Base camp southern end of the lake. There had been a drought at Lake Eyre for seven years, but as soon as Campbell and his huge entourage arrived in the Australian autumn of 1963, the heavens opened. The bad weather would plague the Bluebird team from that point on, eventually flooding the lake and causing the abandonment of the record attempt that year. Then came another blow. On August 5th, 1963 an almost unknown American set a new record of 407.45mph at Bonneville Salt Flats. His name was Craig Breedlove, and his “car” was a three-wheeled device with a pure thrust jet engine called Spirit of America. It did not, however, conform to the rules laid down by motorsports world governing body the F.I.A., and the record was not recognised officially. But it did fire increasing criticism of the Bluebird Project. Sir Alfred Owen arrived in Australia with a flurry of publicity, accusing Campbell of mismanaging the record attempt, while questioning his ability to drive the car to its full potential. He also raised questions over who actually owned Bluebird. Campbell retaliated by challenging Owen to a television debate and finally had his solicitor issue a writ for defamation on Sir Alfred in his Adelaide hotel. More fuel was added to the fire, when later that year, Breedlove also arrived in Adelaide, and after examining Lake Eyre as a possible venue for his next record attempt declared he could go faster with a fraction of the money and support that Campbell had at his disposal. Eventually, Campbell’s dispute with Owen was resolved, but by this time he found himself locked into staging the attempt at Lake Eyre. So in 1964, he returned only to face the same problems with the weather, the car, and a team who had started to believe in a Campbell jinx. Even Campbell’s ability to drive Bluebird was brought into question as rumours of a phobia of really high speeds persisted, because, it was said, of his Bonneville crash. Campbell discusses problems with the track after a run. And indeed, Campbell’s approach was cautious. The effects of the crash had taken their toll, and the possibility of damaging the car again must have weighed heavily on his mind. But to the press and an increasingly sceptical public, Campbell no longer had what it takes. To make matters worse, Andrew Mustard, a significant member of the team whom Campbell had contracted to build the track on Lake Eyre, and who was also responsible for the enormous Dunlop tyres fitted to the Bluebird car, became increasingly critical of Campbell’s reluctance to go for the record. As Bluebirds nominated reserve driver, he began to openly offer to do the job himself. More controversy erupted when the Confederation of Australian Motorsport officials, whose job it was to verify the record should it be achieved, insisted that Campbell have a medical examination on the grounds he was unfit to drive Bluebird. A huge argument ensued, putting the whole record attempt in jeopardy until a compromise was reached and Campbell agreed to take the medical. Weeks dragged past as trouble with the track, and the weather continued, until finally, on July 17th, 1964, on a track surface that was far from ideal, Campbell at last set a new official Land Speed Record of 403.10mph. Longines timing photograph. The record at last. It was still, however, in the back of Campbell’s mind to try for “the double”, a feat not even achieved by his father, and plans were laid in Australia for an attempt on his own World Water Speed Record. Lake Bonney at Barmera in the South Australian Riverland was tried, but poor weather made it unsuitable. Lake Dumbleyung in Western Australia held promise, but problems again with the weather made it seem as though breaking both records in the same calendar year would elude Campbell. The team had just about given up, when on the last day of 1964, with only three hours of light remaining, conditions improved sufficiently for Campbell to set a new World Water Speed record of 276.3mph. This was to be Campbell’s swan song, for now, the world was looking to the heavens for its heroes. The space race had generated a new breed of men, strapped atop enormous rockets, full of raw, explosive power, yet controlled with incredible precision by computers. With almost monotonous regularity these men were tossed into space, orbiting the earth at over 26,000mph. Bluebird K7 on display at Barmera in the South Australian Riverland. Donald Campbell became a man trapped between eras, belonging to neither. 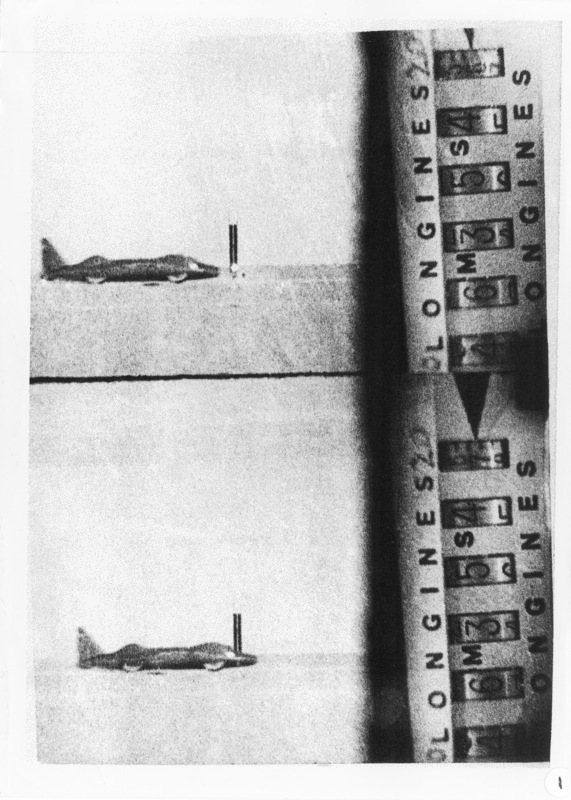 Few were interested when he proposed a new rocket-powered car to break the sound barrier. Science, it was said, not a man’s bravery, would now test the laws of psychics. Perhaps then, on that cold winters morning at Lake Coniston, there was only one piece of equipment aboard the Bluebird hydroplane that could not have been scientifically perfected – only one component that was truly being tested to its limit and way beyond. 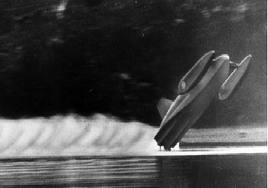 Perhaps it had always been, Donald Campbell himself. Words Geoff Dawes (C) 1997. Colour photographs John Workman (C) 1964. B/W photo’s courtesy Les Jackson. Article published in Classic and Sports Car April 1997 and Australian Classic Car June 1997. 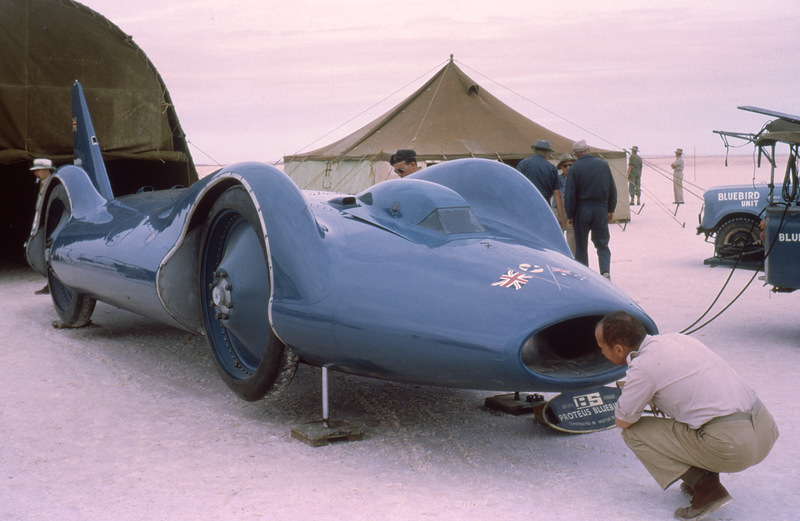 This entry was posted in Motoring and tagged Bluebird CN7, Bluebird K7, Bonneville Salt Flats, Craig Breedlove, Donald Campbell, Lake Dumbleyung, Lake Eyre, Land Speed Record, Malcolm Campbell, Sir Alfred Owen, Tonia Bern on 16/09/2013 by Geoff Dawes.